The use of a speech recognition system allows access to an simple and efficient interaction, among others, for people with disabilities. In this article, an automatic speech recognition system is presented. It was developed as a system that allows an easy adaptation to different platforms. The model is described with clarity and detail looking for reproducibility by researchers who wish to resume and advance in this field. The model is divided into four stages: acquisition of the data, preprocessing, feature extraction and pattern recognition. Information concerning the functionality of the system is presented in the section named experiments and results. Finally, conclusions are set and a future work is proposed, in order to improve the efficiency and quality of the system. 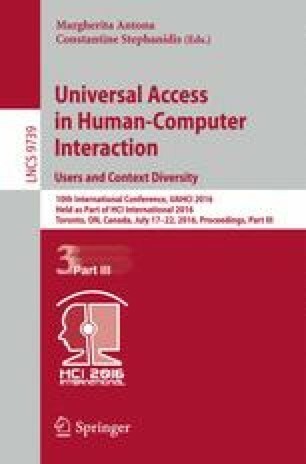 The research presented in this paper was partially funded by the COLCIENCIAS project entitled: “RAIM: Implementación de un framework apoyado en tecnologías móviles y de realidad aumentada para entornos educativos ubicuos, adaptativos, accesibles e interactivos para todos (Implementation of a framework supported by mobile technologies and augmented reality for ubiquitous, adaptive, accessible and interactive learning environments for all)” of the Universidad Nacional de Colombia, with code 1119-569-34172.